For a Halloween twist on traditional Chex mix, try our Witchy Snack Mix. 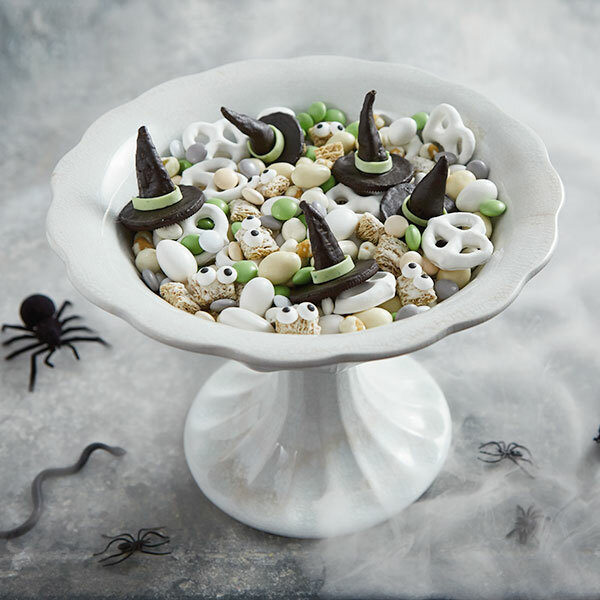 This easy-to-make Halloween treat features chocolate chips, wasabi peas, Oreos, yogurt-covered raisins plus candy googly eyes for an even more wicked sweet-and-salty mix. But you can throw in any Halloween treats that make your hungry ghouls happy. Line a baking sheet with waxed paper and lightly spray with cooking spray. Melt ½ cup of chocolate chips in the microwave, stirring every 30 seconds until completely melted. Thin the mixture with a little vegetable oil, adding the oil 1 teaspoon at a time, until the chocolate is thinner but not overly runny. Add black food coloring, if desired, and stir to blend. Open the Oreo cookies and use the half without the filling as a hat base. Brush or spoon a small amount of chocolate onto the hat base to cover. Dip a Bugle into the chocolate and place in the center of the Oreo base. Add a strip of candy ribbon to cover where the cookie and Bugle join, using tweezers to apply. Allow chocolate to harden fully before adding the witch hats into the rest of the mix. Attach candy googly eyes to cereal pieces using remaining melted chocolate. Allow chocolate to harden. Mix all the snack mix ingredients in a 1½ quart bowl. Scatter witch hats around on top of the mix.